Smith and Wesson Over-sized leg irons with 14" high-security heat-treated chain and larger dimension, elliptically contoured satin nickel cuffs. Smith & Wesson Handcuffs are fabricated from the finest quality carbon steel. They are manufactured with heat treated internal lockworks, featuring smooth ratchets for swift cuffing and double locks to prevent tampering. 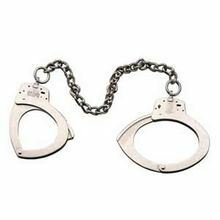 All S&W handcuffs meet or exceed demanding U.S. National Institute of Justice tests for workmanship, strength, corrosion and tamper resistance.